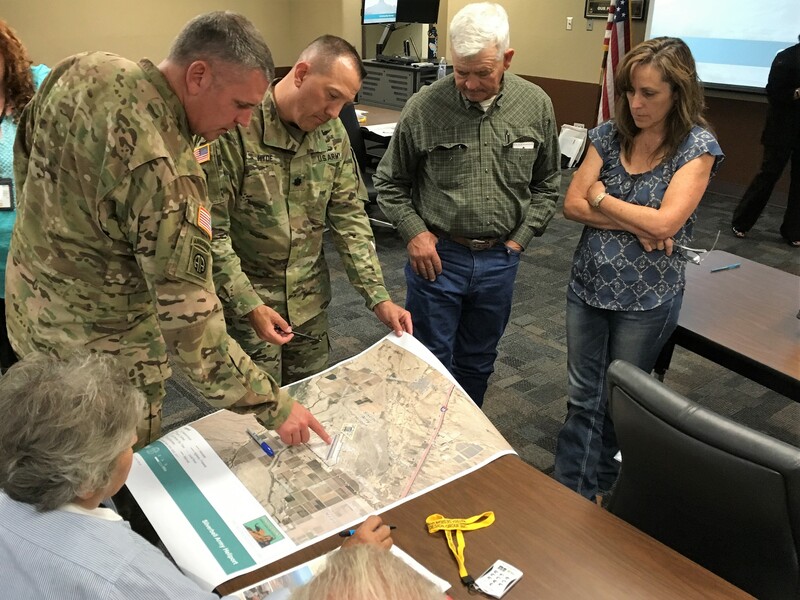 The Pinal County Joint Land Use Study (JLUS) is a joint planning effort led by Pinal County with support of the Arizona National Guard (AZNG). The project also includes a broad group of stakeholders and participating organizations that comprise the Policy Committee and Technical Working Group involved in the project development. The menus at the top of the page provide access to the key information for the Pinal County JLUS. Thank you to all who attended the first set of public workshops for the Pinal County Joint Land Use Study (JLUS). Thank you to all who attended the second set of public workshops for the Pinal County Joint Land Use Study (JLUS). If you were unable to attend the workshops, you can still provide your input on the importance of the compatibility issues by responding to the online survey by clicking here. Thank you to all who attended the second set of public workshops for the Pinal County Joint Land Use Study! 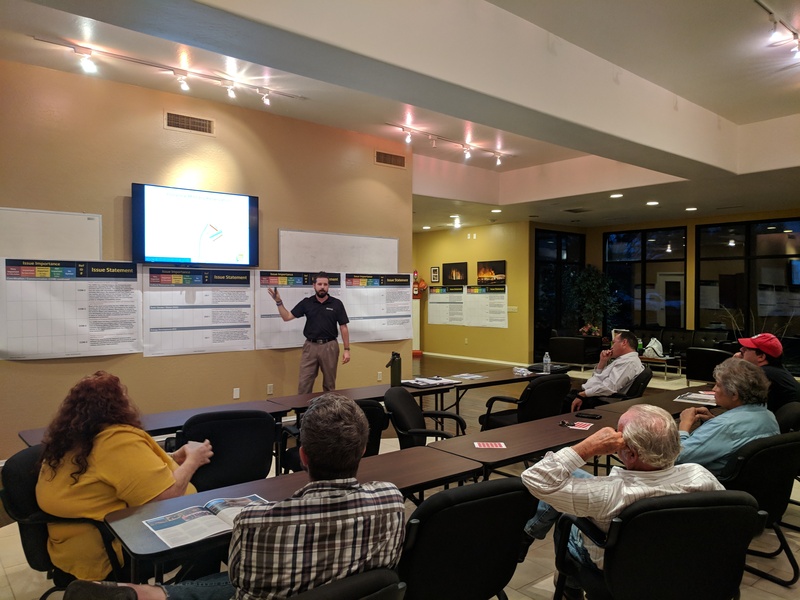 Two separate workshops were hosted by Pinal County, in partnership with other project stakeholders including the Village of Red Rock, Town of Florence, and Arizona National Guard. The workshops were held on Monday, October 1 from 6:00 to 8:00 p.m. at the Red Rock Fire Station and on Wednesday, October 3 from 6:00 to 8:00 p.m. at the Florence Library and Community Center. 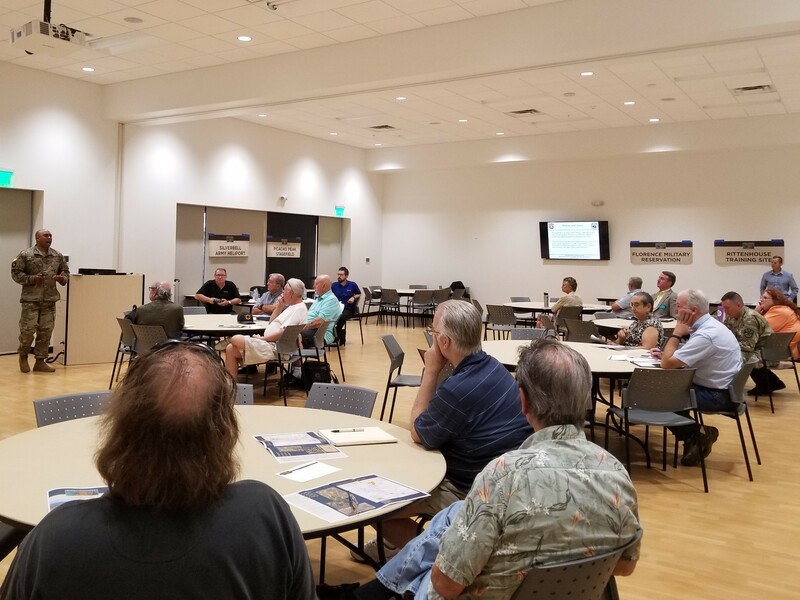 This set of public workshops provided an update on the JLUS project progress, presented the Arizona National Guard military mission footprints, and allowed the public an opportunity to provide input on the importance of each compatibility issue that has been identified through this JLUS process. The issues being evaluated are the result of comments and feedback obtained from the JLUS Policy Committee and Technical Working Group (made up of representatives from the jurisdictions, agencies and organizations involved in this project), stakeholder interviews, and public input provided at the first set of public workshops that were held in June 2018. At the workshops, participants were able to learn more about existing compatibility concerns and provide input on the actions that should be considered to address them. Click Here to download a copy of the presentation that was given at the second set of public workshops. 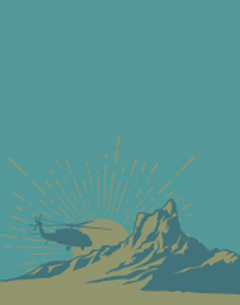 Click Here to download the AZNG military footprint maps that were presented at the second public workshop. Thank you to all who attended the first set of public workshops for the Pinal County Joint Land Use Study (JLUS). Pinal County hosted the first set of public workshops for the Pinal County JLUS on June 4, 2018 at Silverbell Army Heliport and June 5, 2018 at Florence Library and Community Center. The material presented at the two workshops was the same. During the workshops, participants were given an overview of what a JLUS is, how it is being developed, the stakeholders involved, and an opportunity to provide their input on the potential issues in the vicinity of the four Arizona National Guard sites that are part of the study through an interactive, real-time survey. If you were not able to attend the workshop, it’s not too late to provide feedback. Click Here to take the survey that was given at the workshop. The presentation from the workshops, including the results from the survey are available for view by Clicking Here.